House Lannister of Casterly Rock, the clan of many key characters in HBO’s adaptation of Game of Thrones, is principal house of the Westerlands. The Lannisters are the richest family in the Seven Kingdoms, due in large part to the many gold mines under their control, despite by no means being the largest kingdom. Their sigil design is a lion rampant; their motto is “Hear Me Roar”. 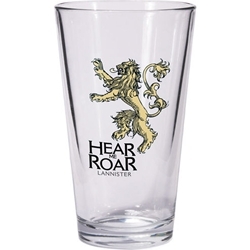 This Game of Thrones Lannister Pint Glass holds 16 ounces.